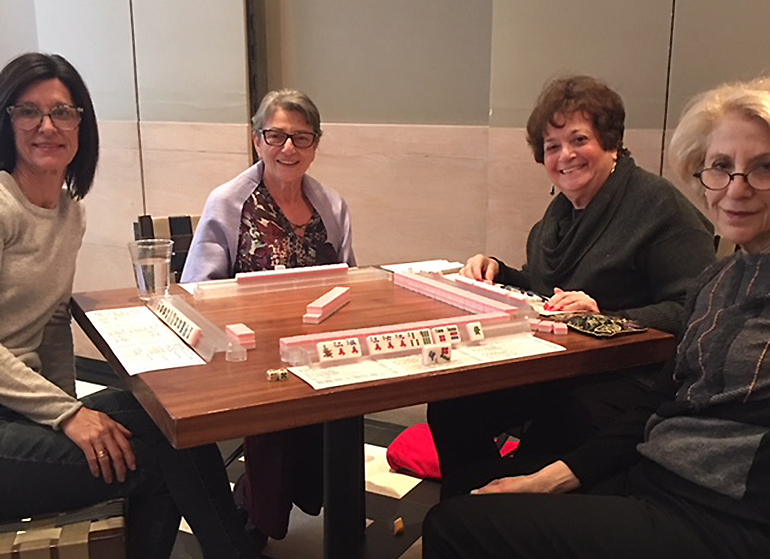 After taking lessons with Linda years ago, I rediscovered mah jong with a passion that I can indulge every Monday at Linda’s Mah Jong Club. She makes all levels feel welcome and included, and even more importantly, finds just the right spot for every player. Whether you are a beginner or a tournament champ there is a table for you at Linda’s. She takes the time to get to know each person and is so patient. Wouldn’t be a Monday without a trip to Mahj paradise! Thank you, Linda! I can't thank Linda Feinstein enough for providing me with the most wonderful Monday afternoons. Although, I am not as experienced a Mah Jongg player as some of her regulars, they have embraced me and made me feel welcome. The game is perfect, thought provoking, and fun. It is a special environment for playing this time-honored game. The afternoons spent at Sarabeth's are incredibly well organized, all I have to bring is my MJ card and sometimes a lucky charm. Everything runs so smoothly!!! Linda you do a great job. All week long I look forward to Monday Mah Jongg with Linda. Everything about it—the location, the food, the hours of playing mah jongg and Linda herself—is fantastic and fun. If you’re a dedicated mah jongg player or even a newbie, there’s no better place to play! Three years ago my sister-in-law gave me a beautiful MJ set for my 70th Birthday and MJ lessons, a card and an introduction to Linda Feinstein and the Manhattan Mah Jongg Club. I started to go to the Monday afternoon games not knowing anyone. 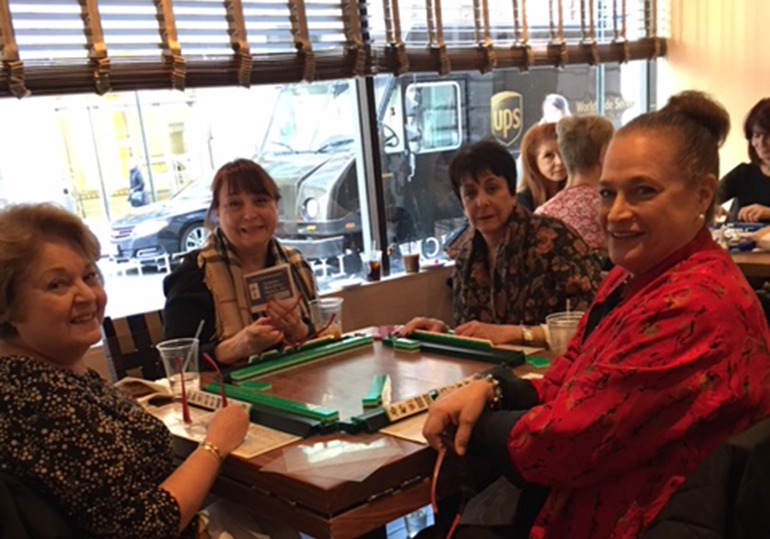 The first few weeks, Linda assigned me to a different table each week with other beginners and I played, chatted and enjoyed every minute of my day. 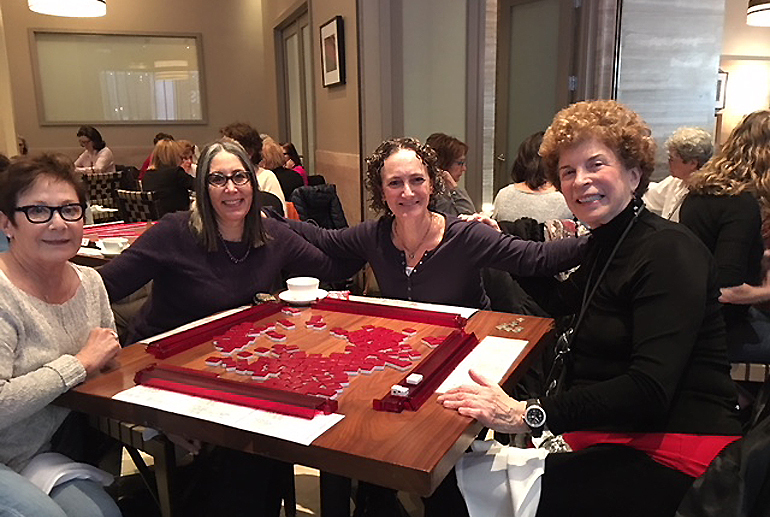 Then after about 5-6 weeks, I sat at a table with three other women of equal skills and had a wonderful afternoon. We requested to sit together from that time on. Soon we were continuing our afternoon at Happy Hour. Then dinner also. Still later going to theater together. Now 3+ years later we are great friends. This has been one of the most rewarding experiences of my life. These 3 women are part of my social and personal life. Thanks to Linda and Mah Jongg! Copyright © 2009-2019 - Linda Feinstein - All Rights Reserved. This website is not affiliated with any other Manhattan Mah Jongg website.